An anime with a video game, RPG, fantasy type setting (yes another). KonoSuba: God’s Blessing on this Wonderful World! 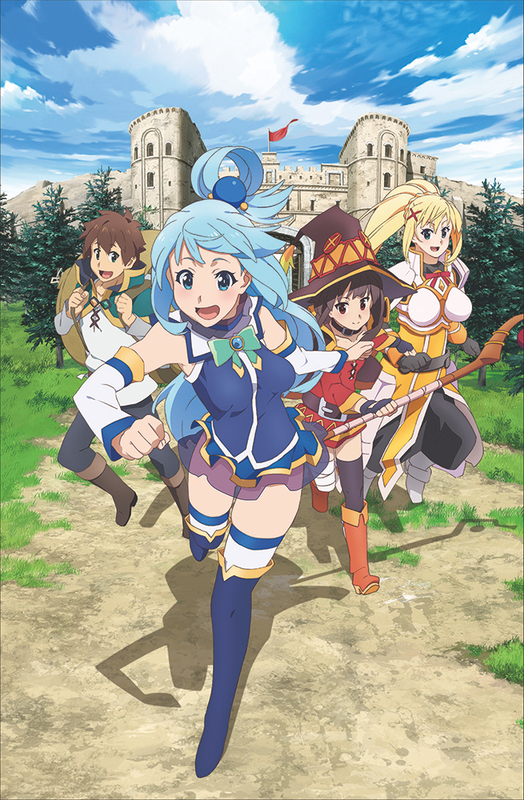 (Konosuba) returns for a second season and for the continuation of Kazuma and co’s adventure. A bite-sized 10-episode run featuring comical tones and all the typical crazy breast physics you can get. If you’re looking for an otaku protagonist in a fantasy-esqe setting, you’ve come to the right place. Kazuma Satou is a sixteen-year-old game-obsessed student. After an untimely death, he meets a goddess named Aqua who offers to reincarnate him. Now he is plunged into a parallel fantasy RPG style world. Due to his inexperience, Kazuma chooses the goddess of water, Aqua to accompany him, instead of some other ability or weapon on offer. The pair travels through the land, encountering a number of characters and individuals and forming something of a fellowship. This is where the adventure begins. Picking up from the first season’s penultimate episode, Kazuma has been arrested for treason for accidently blowing up a noble’s mansion. It’s up to Aqua and friends to set him free as he finds himself facing a trial. Following accusations made regarding Kazuma’s connections with the Devil King, the trail begins and Kazuma must find a way prove his innocence. His fellow party members come to his rescue once again, and Kazuma’s friend Darkness reveals her heritage and convinces the judge in the trial to allow Kazuma prove his innocence by repaying the damages he caused to the mansion in the previous season. After legal proceedings are dealt with, the adventuring party learns of a pathway to Keele’s Dungeon and begin investigating. As a result of a magical circle that Aqua had drawn in the dungeon, the party must battle monsters and other dangerous beings that threaten the safety of the nearby town. Mysteries and forces of greater evil are released in the world. The party now has to battle their way towards a showdown with the Devil King and his followers. In typical fashion, the intro to KonoSuba is a rocky, j-pop theme. The creators decided to change the music from the previous season, and I wouldn’t say that this one is better than the previous. To say they are both on par and not the most memorable tunes would be a fair comment. You won’t be humming this one all day, let’s leave it at that. With the outro music, yet again we get more clichés and without me describing the music to you, I’m sure you can guess what it sounds like. The art style in KonoSuba is where this series shines. An improvement in some areas on the last season, it has to be said, but not a masterpiece and still showing slightly dodgy animations. There are some noticeable improvements in the magic animations and further detailing in the backgrounds and other viewpoints. It stands up against most anime on the market. 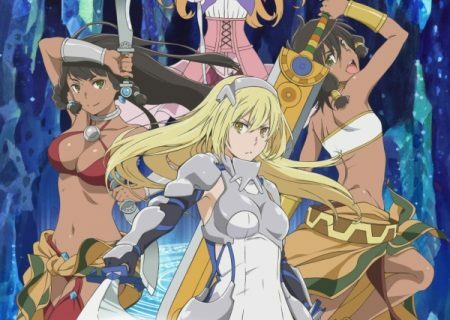 Anime set in an alternative RPG style world seem to be everywhere these days. What KonoSuba does well is to incorporate interesting characters that you can actually care about. The world of Konosuba is as interesting as the abilities of those who inhabit it and this is a major strength it has over other similar series. At 10 episodes long per season, you have to ask if the creators wanted quality over quantity of that they just didn’t want to throw a load of money at something they were not convinced in. The answer in my book would be the former. Comical tones, interesting characters, and some decent plot points help to keep you engaged. Despite some characters voices wanting to make you rip your ears off, KonoSuba is fun and it’s an anime that knows its strengths and it plays up to them well. I enjoyed the series more than I thought I would when returning to it after the first season. KonoSuba wasn’t one of those series I was crying out to return to, but I found myself almost binge-watching episodes when I realized it had been released. 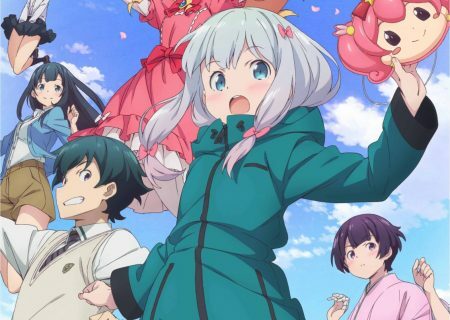 Without having the commitment of 30-episode anime series, I found myself willing to bypass some of the plot flaws and minor issues I’d have with other anime. By the end of the series, I didn’t feel as worn out as I have with longer series. Having a few laughs can really help pace a series and give a welcome break from some of the action. Kono Subarashii Sekai ni Shukufuku wo does the funny stuff well in places, which became more apparent after I’d finished the series and took some time away from it. This one is a grower for sure if there is such a thing when talking about anime. If a friend asked for a series set in an RPG fantasy world, this would certainly be one of my recommendations. The first series is kind of a must with KonoSuba as it sets up a lot of the story for this second season. With only 10 episodes each season, it’s worth your time. My impressions of this series are mostly positive, but that’s not to say that this show is for everyone. Viewers who like darker and more realistic tones won’t find much common ground here. KonoSuba even verges on becoming silly at times, but its light warm tone kept me coming back and actually enjoying myself. As a fan of video games, fantasy, and RPGs, this series had me at hello. The more and more I watched it, the more I found a lot of aspects I enjoyed. Personally, I like the 10-episode length (the last time I mention it I swear). It gave me the freedom to watch other things without that commitment longer animes command. In my busy schedule, I found I’d make time for something more manageable and less time consuming, rather than avoiding something longer due to time restraints. Expect to have some laughs, giggles, and a few silly moments. If shorter anime runs are not your cup of tea, you’ll probably want to avoid this one. 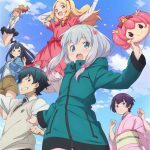 All reviews for KONOSUBA -God's blessing on this wonderful world! KonoSuba: God’s Blessing on this Wonderful World! 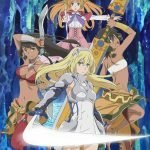 2 Episode 5 Review: Servitude for This Masked Knight! KonoSuba: God’s Blessing on this Wonderful World! 2 Episode 6 Review: Goodbye to This Irritating Living World! 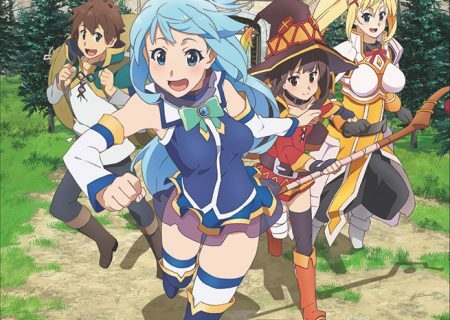 Click here for reviews of the anime KonoSuba 2!